I was shopping at Metro in La Seyne yesterday when I came across these lovely “Radis Bleu” or Purple Plum Radishes as I think they’re known as in English. I love the grainy purple and white flesh and how it’s so different to any vegetable I’ve seen before, it really catches the eye. I’m always discovering new veggies and looking to develop my repetoir so inspired by these blue beauties I came up with this simple yet colourful salad recipe. Finely shred 120g of washed Savoy cabbage and kale leaves. Peel about half a radish and slice thinly. Pile up the slices of radish and slice to make thin matchsticks (julienne). In a separate bowl add two tablespoons of groundnut oil/good quality sunflower oil, one tablespoon of soy sauce, a splash of rice vinegar, half a teaspoon of honey, a small grating of garlic and ginger and some salt and pepper (easy on the salt because the soy is very salty), mix well. 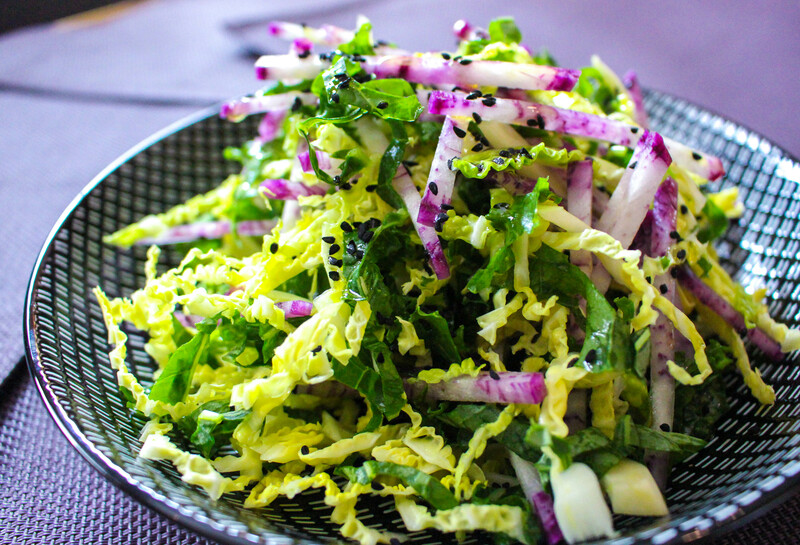 Combine the dressing with the vegetables and add some black sesame seeds. This will make one serving of salad as a main dish or can be shared as a side dish for around two or three people.